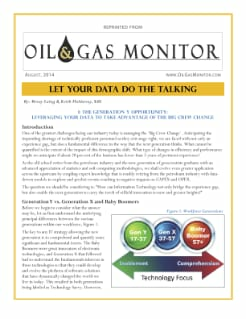 This article provides insight into how technology can help bridge the gap created by the impending retirement of large numbers of experienced personnel in the oil and gas industry. Find out the differences between the generations (X, Y and Baby Boomers) and their perceptions and expectations of technology. The authors explain the opportunities and challenges those expectations create for the industry as a whole. Learn more about the importance of moving to data-driven methodologies so that you can let your data do the talking and create innovation in the industry.